Disclosure: I received a sample as compensation for this post. Opinions expressed are my own. I can almost hear the squeals of delight from my 9 year old daughter. 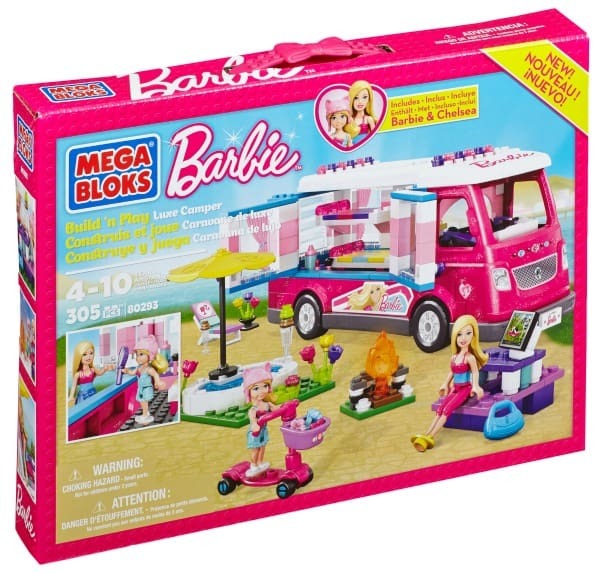 I’m giving her an Easter gift that I know she is going to love: a Mega Bloks Barbie™ Build ’n Play Luxe Camper. I loved playing with my Barbies as a little girl. I had a trunk full of Barbies, clothes and other accessories. I remember spending hours playing with them. My mom even kept some of my old Barbie’s for the girls to play with when they visit. Mega Bloks Barbie™ Build ’n Play Luxe Camper is ideal for ages 4 to 10 and features a buildable vacation camper with hot tub, scooter and picnic table. Barbie™ and her little sister Chelsea™ head out on a coast to coast, fun-filled road trip in the Mega Bloks Barbie™ Build ’n Play Luxe Camper. Build and decorate the sparkling pink camper any way you want as Barbie™ and Chelsea™ visit all of their favorite attractions and hottest stores. Now it’s time to unwind and take a dip in the hot tub before setting up the picnic table for a tasty treat. Later, Barbie™ builds a fire and lazes around on a lounge chair, while Chelsea™ heads out for a quick scooter ride. Glamping has never been more relaxing! This sparkling holiday cruiser opens up to reveal everything and let you enjoy the Camper on the inside, including bunk beds, make-up area and the front seats. Set out on the road with Barbie™ and Chelsea™ and make it a trip you’ll never forget! 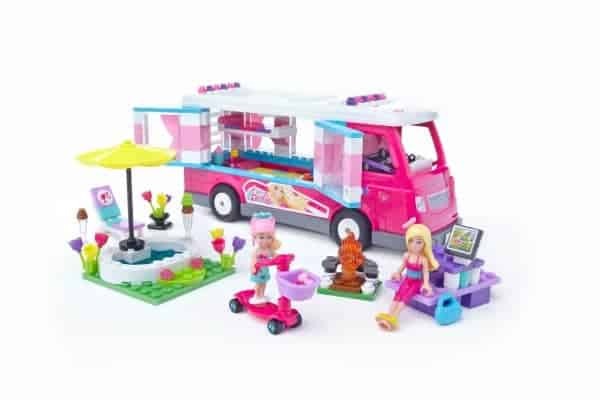 Combine your Build ‘n Play Luxe Camper with other Mega Bloks Barbie™ sets and build the Barbie™ world you imagine! Highly detailed accessories like a fire pit, lounge chair, picnic table, flowers, make-up kit, bunk beds, and so much more! Combine with all of the Mega Bloks Barbie™ sets to build a fabulous world of fashion, friends and fun! For more information, check out the Mega Bloks Barbie™ Official Site. My daughters would love to play with this. It would be the perfect addition to the doll houses and other toys they already love. If I won- I’d give this to my niece. I would give this to my friends daughter. She is the perfect age and would love it! I would give the set to my niece for her birthday. I would give it to my 3 year old granddaughter. I would give this to my niece. She would absolutely love it! I would give this to my niece who is turning 5 in a few months. I would keep this till Christmas rolls around again and give it to the four year old girl I know as a gift. I would give it to my neighbor’s daughter for her birthday. if i won, i would give this to our daughter. i am tony l smoaks on rafflecopter. I would give this to my Grand Daughters !!! They would love it!!! My 7 year old granddaughter is having a birthday in a few weeks and I would give this cute camper to her, if I won it. Thanks for having the contest. I would give this to my daughter. Thanks! I would give this to my 3 girls!